Hamilton Litestat has extended and made improvements to its range of Elemento weatherproof wiring accessories. Hamilton provides a total outdoor power solution, with its expanded range now including an uprated IP66 certified RCD Unit. Its new casing delivers complete protection against dust ensuring the safe operation of the outdoor equipment such as hedge trimmers and lawnmowers. In addition, it has also introduced two new units to the Elemento range: a Retractive Switch and a Double Pole Switch. 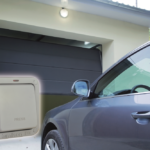 Retractive Switch is a power-safe way for controlling garage doors and entrance gates. When fitted, the switch will automatically sit in the OFF position and must be pressed and held down to switch ON and restore power to the circuit, illustrated by a red neon power indicator. This is particularly suited to garage door applications, where the switch is pressed until the doors are fully open. As per the rest of the range, it is IP66 rated and shares the same lemento aesthetic, which was introduced following a design refresh last year. The new Double Pole Switch offers a maximum load of 20 amps – up from 10 amps for the standard rocker – to safely control higher demand electrical appliances and machinery.